In May John and his brother Andy went to Philadelphia to donate a desk from the Kearsarge Society that was in Captain Winslow's ship cabin. They went down again in July to formally donate it. 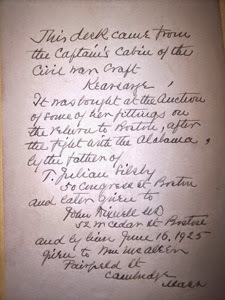 This is a copy of John's speech in front of Admiral Lynch (former head of Annapolis ) and Lt. Colonel Ralph Peters. It is hard to believe, but thirty years ago this summer I was training to become a United States Marine down at Paris Island. My father wrote me at the time and told of how President Reagan was going to Mainland China. The press pulled Secretary of State George Shultz aside and asked if this was the first time the President has visited a Communist country? Without hesitation the Secretary responded, " Well he has been to Massachusetts ". If the truth be told, Massachusetts and New England played a major part in the events that lead up to the Civil War. The Abolitionist movement; Harriet Beecher Stowe's novel Uncle Tom's Cabin ; John Brown did much of his fund rising throughout New England ( Ralph Waldo Emerson was an early supporter but became disillusioned with Brown after Harper's Ferry ); Daniel Webster was instrumental in the passing of the Missouri Compromise. Other events such as the Dred Scott decision; Bloody Kansas; and the Lincoln/Douglas debate helped ignite the inevitable. In New England the navy warships were built. 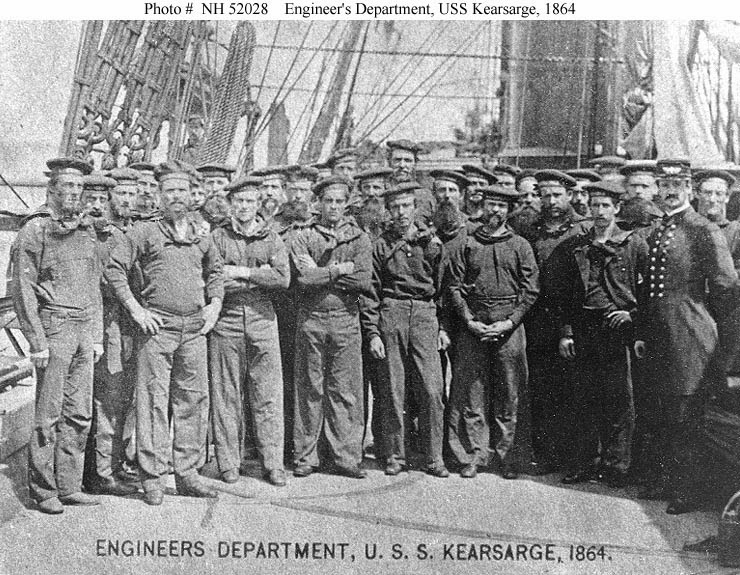 The USS Kearsarge was named after Mt. Kearsarge in New Hampshire that supplied the timber for her existence. It was launched from the naval shipyard in Portsmouth, New Hampshire. The south converted cargo ships into raiders, however the CSS Alabama and CSS Florida were purchased in England under the guise of being merchant ships. This past Monday was the 153rd anniversary of the first battle of "Bull Run". July 3rd marked the 151st anniversary of the northern victories at both Gettysburg and Vicksburg. 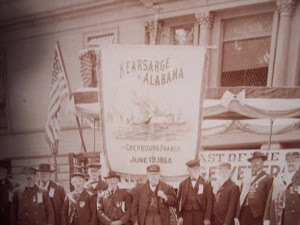 Two weeks shy of a year later the USS Kearsarge and CSS Alabama faced off each other outside the port of Cherbourg, France. By then the international community recognized the Confederacy was losing its fight for independence. 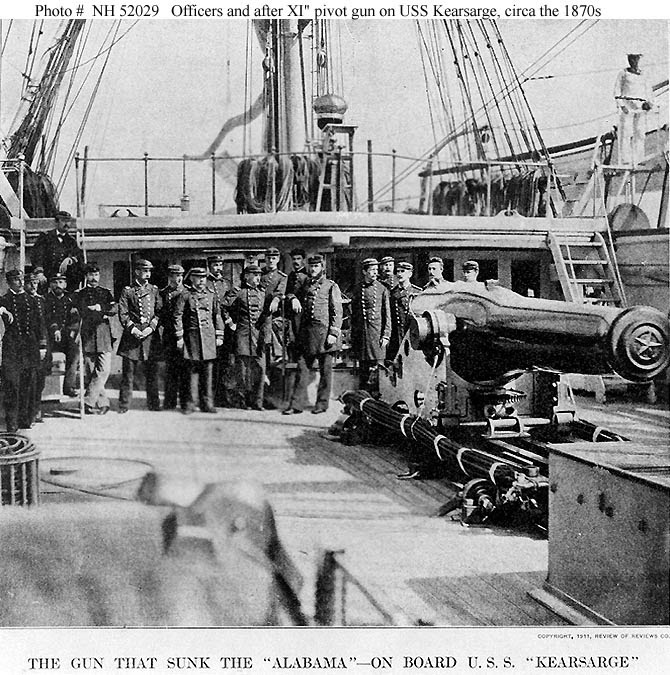 It is believed that Captain Raphael Semmes, in command of the CSS Alabama, felt a victory over the USS Kearsarge would lift Southern Morale. 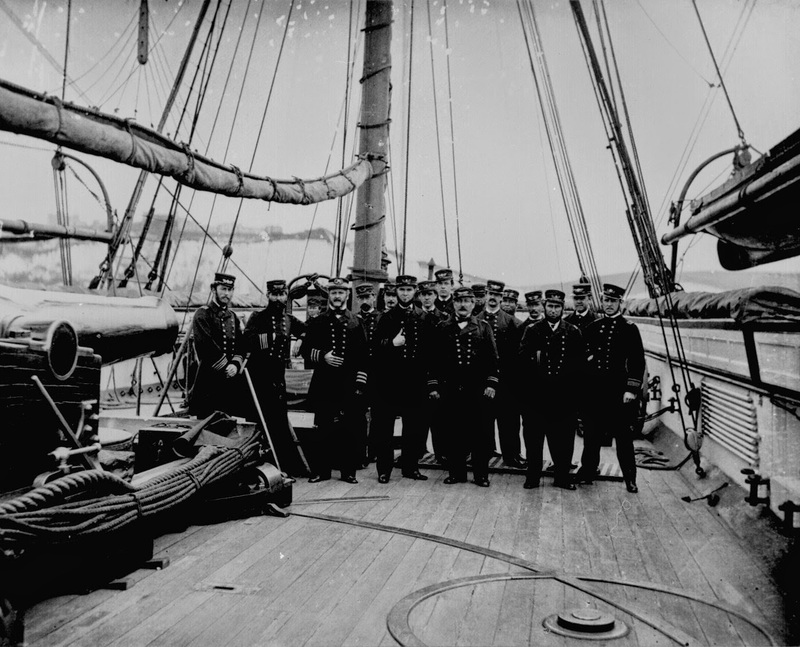 Of the three major naval battles of the Civil War this was the most exciting. On January 11, 1863 the CSS Alabama defeated an inferior ship, the USS Hatteras in the Gulf of Mexico. 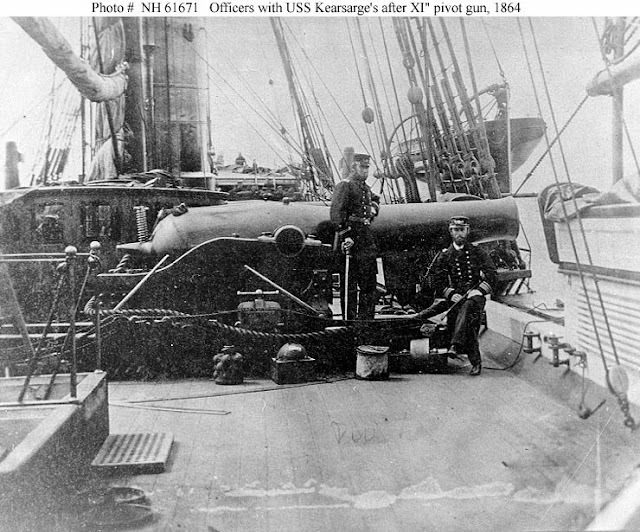 Ironically Captain Semmes accused the USS Keararge of cheating because it used chain armor alongside the ship's exterior. 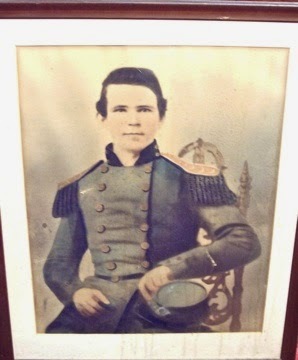 However 2nd Lt Arthur Sinclair, of the CSS Alabama, said Captain Semmes was well aware of this fact before the battle. 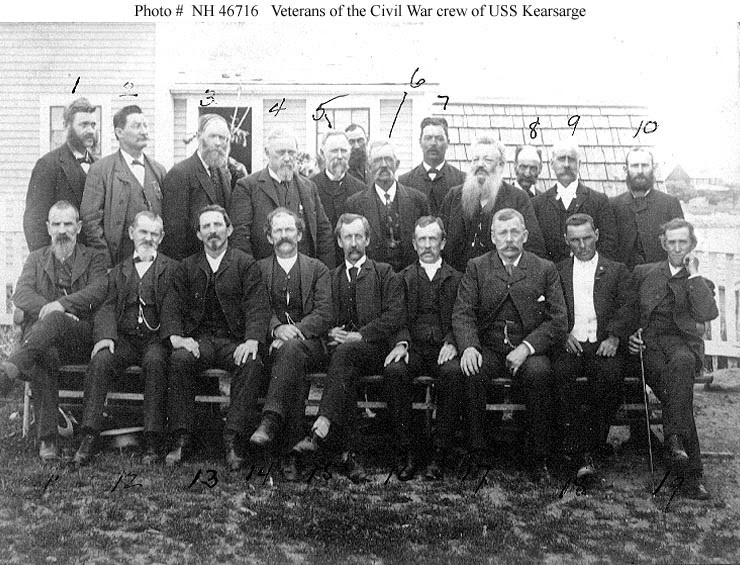 If the truth be told Captain John Winslow, of the USS Kearsarge, had a well trained and disciplined crew. The Alabama was made up of sailors from around the world. It fired many shots at the Kearsarge, but it was clear that the quality of the shells were effected from the storage in between the engine room and the water distiller, causing the magazines to be ruined by humidity.
" Deerhound ", including R. K. Howell, the brother-in-law of Jefferson Davis. To have had a family member witness this moment has always been a source of pride for my father, brothers and myself. When my brother Andrew and I visited in May we walked around " Independence Hall ". There was a group of retired men walking around with their wives wearing 402nd Tanker Division hats. It was clear they were proud of their military service, and it was even more clear talking to them that their enlistment helped shape their character and make them the men they became. The next day Andrew and I went to Lancaster county and stopped into a store named after President Lincoln's secretary, John Hay, who later served as Secretary of State for both President McKinley and Roosevelt. On the way out we talked to a man wearing a Navy Sea Bee's hat. He served as an officer for twenty years. When I mentioned that Andrew served in Afghanistan as a combat historian, his face lit up and he said, " My dad was a photographer during World War II and was responsible for taking the pictures at Nagasaki ". History is all around us. I hope this desk and its history will be enjoyed by future generations. 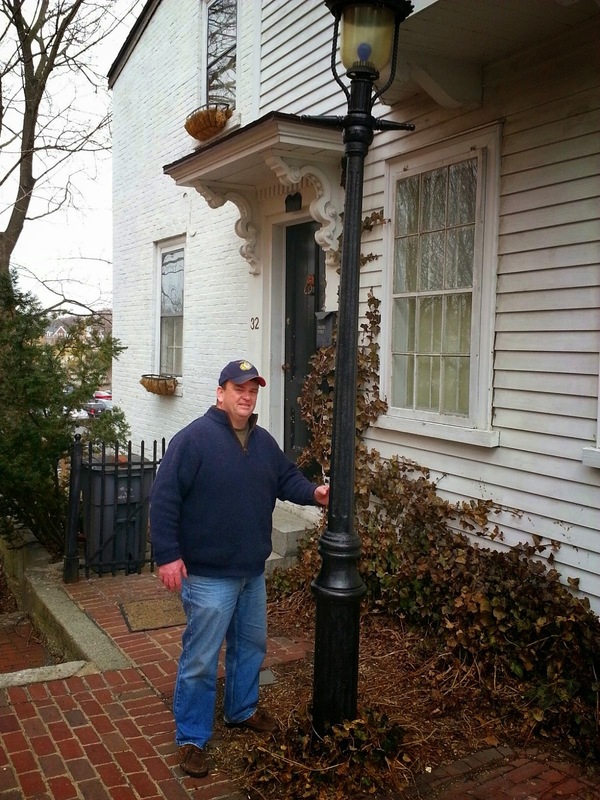 The story below is from George Costopulos Auctioneers located at 9 Cerqua St.Woburn, MA 01801 Andrew McAleer & John J McAleer the lll are two gents who currently live in Lexington ma. 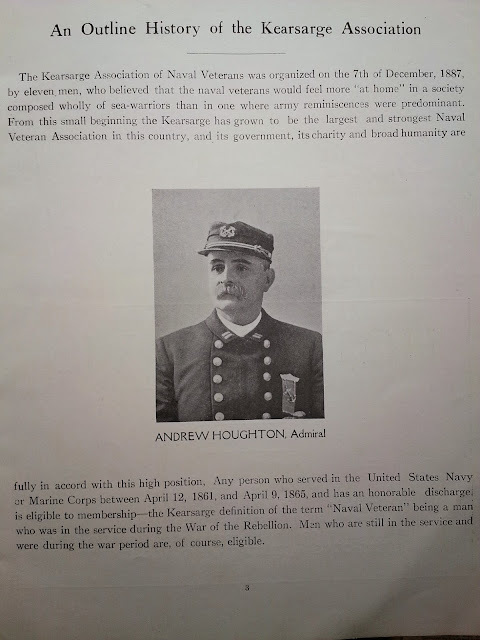 They come from a long military family history, their great grandfather John J. McAleer served on the USS Kearsarge as an orderly to Captain Winslow. He also kept the log book of the Kearsarge for it's 34- month cruise. He wrote the log on Captain Winslow desk. The same desk that was present in the Captain quarters during the battle with the Alabama on June 11, 1864. (As a side note this June 11th 2014 will be the 150 anniversary of this important battle.) This was the story they always heard growing up and took great pride in having this historic desk. John J. McAleer lll inherited the desk from his dad John J McAleer ll who acquired the desk in 1925 from his uncle Billy, John William McAleer, who was the oldest son of John J. McAleer, orderly to Captain Winslow. In the desk there has for the last ninety year a letter that stated "This desk came from the Captain’s cabin of the Civil War Craft Kearsarge. It was bought at the auction of some of her (Kearsarge) fittings on the return to Boston, after the fight with the Alabama, by the father of T. Julian (sic) Silsby, 50 Congress Street Boston and later given to John Dixwell MD 52 Cedar St Boston and by him June 16, 1925 given to Wm. McAleer of Fairfield St Cambridge Mass." This is the story that the two brothers had heard growing up and there was much fact to back this story. They had the oral history along with photos, medals and paper documents to back this story up. But how did the desk get to uncle Billy and who was Dr. Dixwell, T. Julian Silby and the father of T. Julian Silby who are mentioned in the letter. The Kearsarge, after the battle with the Alabama and other duties, cruised into Boston harbor at one o'clock in the morning on November 8th for much needed repairs. Thousands of New Englanders turned out for the Kearsarge home coming. After all the Kearsarge was named after New Hampshire's Mt Kearsarge and the ship was built from the timber surrounding Mt. Kearsarge and her crew were mostly New Englanders. The ship was temporarily decommissioned for repairs. The questioned remained, were T. Julian Silby, his father and Dr Dixwell real historical figures? It turns out after much research that T. Julien Silsby and Father Thomas J. Silsby owned a cordage company in South Boston, (Thomas J. Silsby & Son) who did this kind of ship repair work. It stands to reason that father Silsby could have acquired the desk at an auction of the Kearsarge fittings and passed it to his son T. Julian Silby, who according to the letter passed it on or sold the desk to Dr. Dixwell. Is Dr Dixwell a real historical figure? It turn out that he is real and held a prominent position in Boston & Kearsarge history. 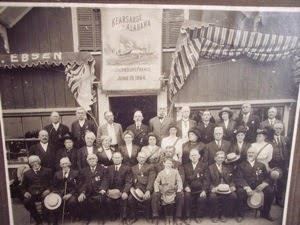 After the veterans of the Kearsarge were finished with their service the survivors gathered for many reunions and enjoyed accolades from across New England. They were treated as heroes for man, many years. 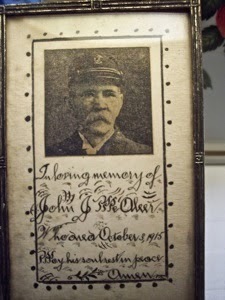 John J. McAleer was very active in serving the veterans & survivors of the Kearsarge . He served as president & secretary to these meeting until his passing. 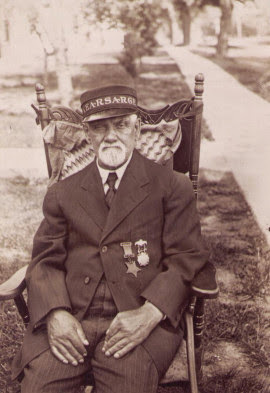 His son John William McAleer “Uncle Bill” in the 1920s served as Secretary of Kearsarge Naval Veterans Association (“KNVA”) and attended annual Kearsarge Survivor meetings documenting dates and attendees.He lived at 26 Fairfield Street in Cambridge, Massachusetts with nephew John J. McAleer, II. In addition, he was a friend and colleague of John Dixwell, MD in the KNVA. Dr. John Dixwell was a Boston Surgeon born in Cambridge, Massachusetts on March 21, 1844. 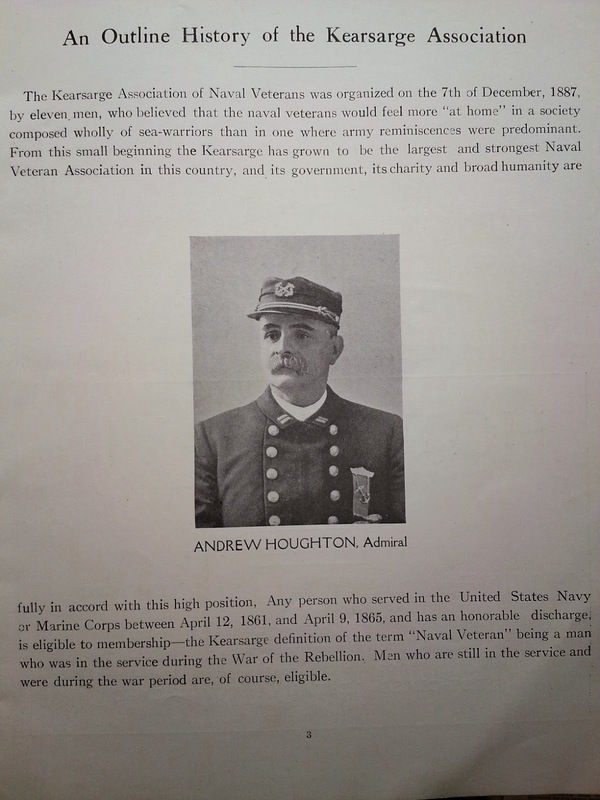 A graduate of the Latin School, Harvard, and Harvard Medical School, Dr. Dixwell served as a President and Surgeon of the Kearsarge Naval Veterans Association, member of Post No. 13, G.A.R., and G.A.R. Club of Massachusetts. He frequently appeared in Boston newspapers concerning his work with the Kearsarge and her survivors. This is the connection between William McAleer (Uncle Billy) and Dr Dixwell. As the provenance letter states, Dr. Dixwell gave the desk to “Wm McAleer Fairfield Street, Cambridge, Mass on June 16, 1925.” Three days before the 61st anniversary of the great battle. William McAleer in turn gave the desk to John J. McAleer, II, who in turn gave it to John J. McAleer, III. John A. Winslow (3d from left) and officers on board the U.S.S. Kearsarge after sinking the C.S.S. Alabama, 1864. 12. 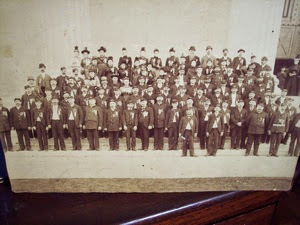 John T. Stackpole;13. Patrick McKeever; 14. Lyman P. Spinney; 15. William Wainwright; 16. Lawrence T. Crowley; 17. True W. Priest; 18. J.O. Stone; and 19. John C. Woodberry. "The unmarked are not veterans." U.S. Naval Historical Center Photograph. 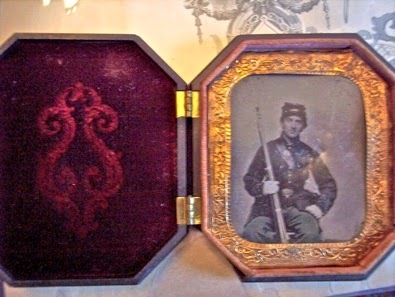 See also Newburyport and the Civil War by William Hallett Bill Hallett and his wife Elizabeth, host “Footsteps of Heroes: Civil War Walking Tours of Newburyport” and are actively involved in the Civil War Roundtable. Acting Master Eben M. Stoddard (left) and Chief Engineer William H. Cushman. 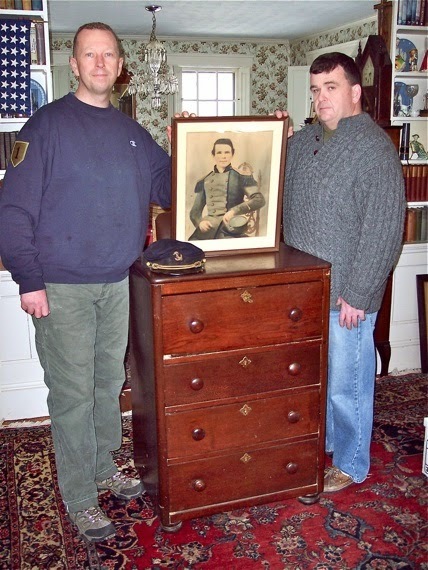 The Civil War relic is the desk from the captain’s cabin of the famed USS Kearsarge that will be offered at the George Costopulos estates auction next Sunday at 2 p.m. at Sons of Italy Hall, 168 Lexington St., Woburn. The 201-foot steam and sail sloop, which was built in 1861 at the Portsmouth (N.H.) Navy Yard and named for New Hampshire’s Mount Kearsarge, became famous when in a one-hour and 20-minute battle on June 19, 1864, off the coast at Cherbourg, France, it sank the Alabama, the most successful Confederate raider of the war. The desk has been consigned by John J. McAleer III of Lexington, whose great-grandfather Private John J. McAleer of Cambridge served as orderly to the Kearsarge’s commander, Captain John A. Winslow (1811-73) of Boston. Winslow, who retired from the Navy as a rear admiral, is buried at Forest Hills Cemetery with a boulder from Mount Kearsarge at the head of his grave. The desk was given in the 1990s to the consignor by his father, John J. McAleer II (1923-2003) of Cambridge, a professor at Harvard and Boston colleges for more than a half-century, who had been given the desk in the 1940s by his uncle John William McAleer, the eldest son of Private McAleer. A letter of provenance is included, written on June 26, 1925, noting that the desk was purchased by Thomas J. Silsby, a Boston manufacturer of cordage machinery, at an auction of Kearsarge fittings when the ship returned to Boston in November 1864 for repairs. 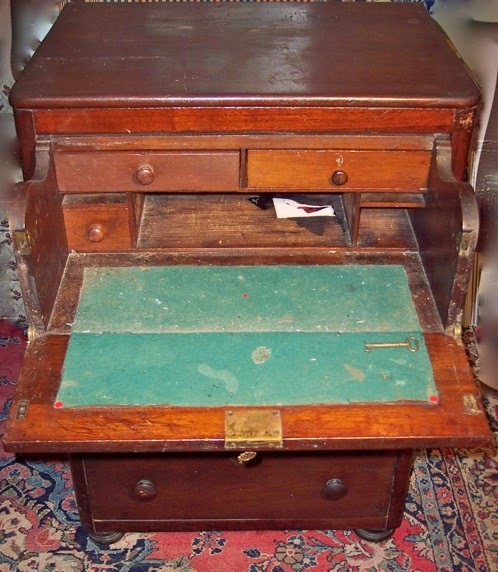 The desk was later acquired by Dr. John Dixwell, a Boston surgeon, who served as president of the Kearsarge Naval Veterans Association, and who in 1925 gave the desk to the association’s secretary John William McAleer. 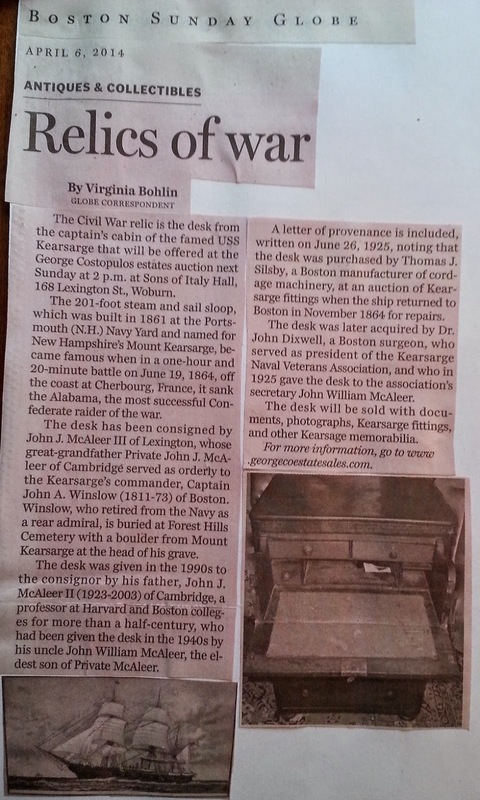 The desk will be sold with documents, photographs, Kearsarge fittings, and other Kearsage memorabilia. For more information, go to www.georgecoestatesales.com. Manufacturers Of Cordage Machinery, Broadway Bridge, South Boston. Of those industries which bear an important part in the growth and prosperity of Boston, that conducted by Messrs. Thomas J. Silsby &: Son may be regarded as a prominent one. This house was established in 1854 by Messrs. Moore & Wood worth, who were succeeded .by Isaac B. Rich, and he, in turn, by Silsby & Cheney, who conducted the business for fifteen years previous to 1880, when the present firm became proprietors of the plant. Since the accession of the senior member of the firm to the head of this house, its business has been largely increased, and its influence for good extended throughout a w ide territory. Being an expert and practical mechanic, Mr. Silsby devoted himself with ardor to the production of machinery which should be equal at least to any made either at home or abn ad, and vie in excellence with all. That his firm succeeded in this object is no matter of doubt; and the excellence they attained in the production of their specialties was such as to have created a demand from the nearest, as well as the most remote points of the United States, Canadas, Great Britain, and other foreign countries.The plant of this house occupies a floorage area of about 12,000 square feet. Thirty operathes, exerts in the manufacture of machinery, are engaged ere; while the machinery and tools in use are of the latest improved designs. The principal products of this house, and those for which it has become so widely celebrated, are for the manufacture of Coticn, Hemp, and Manila Rope, and for the preparation of the raw materials used in the manufacture. This machinery is in many respects novel, ingenious, ar.d unique: and some of it is made by them only. It includes Woodworth's Patent Rope Laying and Banding Machines, John Good's Patent Spreaders, for preparing hemp, flax, and manila; Drawing-Fratr.es, Spinning-Jennies, Forming and Laying Machines. The Rope-laying Machines made here are the onlv ones made in this country. As before remarked, the workmanship of these products may be implicitly relied on. They are strongly made, are durable, and work with the tiimost precision. The firm also manufacture and supply new and improved Pistons and Packing for Steam-Kngines, Pumps, etc., and make a specialty of boring steamcylinders and Corliss valve-seats, without removal from the bed-plates. The individual members of the firm are Messrs. Thomas J. Silsby and T. Julien Silsby, both of whom may be said, through their house, to be thoroughly identified with the advancement of the industrial rmerests of Boston. The standing of this house is so well known as to need no commendation at our hands: suffice it to say, that, in a career extending over so long a period, it has maintained a reputation of which its proprietors may justly feel proud, and for which it is entitled to the highest esteem and consideration. I own a replica of the USS Kearsarge hand made by one of my past customers when I was a Realtor. He made and owned dozens of ships and when they moved he told me to take my pick. The brass hulled Kearsarge was always my very favorite. Its been on my mantle for over 25 years.